North Korean leader Kim Jong-un has said he hopes his children will not grow up into a country burdened with nuclear weapons. "I'm a father and a husband. And I have children," Kim was quoted as saying by Andrew Kim, the CIA's former Korea chief, in a lecture at Stanford University. "And I don't want my children to carry the nuclear weapon on their back their whole life." Andrew Kim said the North Korean leader made the remarks to U.S. Secretary of State Mike Pompeo in April last year, who was then still CIA director, ahead of the first U.S.-North Korea summit, "when asked whether he was willing to end his nuclear program." It is a long chain of hearsay, but Andrew Kim is one of a handful of U.S. officials who have repeatedly met Kim Jong-un and accompanied Pompeo on several visits to Pyongyang last year as well as the summit. He also said Kim Jong-un has already taken on a heavy risk in pushing for summits with the U.S. at all because he has to justify them to the public at home. 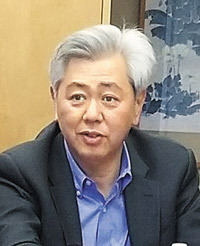 But Andrew Kim warned that the North does want to be recognized as a nuclear state, and its aim is the lifting of all UN sanctions, declaring a formal end to the Korean War, normalizing relations with Washington, and securing the rule of the Kim dynasty under a peace treaty. He said Washington's goal remains to achieve the final, fully verified denuclearization of the North. Washington wants Pyongyang to stop all nuclear and missile tests; provide an inventory of all facilities related to the production of weapons of mass destruction, including nuclear, missile, and biological and chemical weapons, and shut them down; and give access to U.S. and international inspectors. He added sanctions should only be eased when full denuclearization seems in sight.